Vintage Ad Archive: Raise A Glass Of Whiskey To St. Patrick's Day! St. Patrick’s Day is once again upon us, that time of emerald imagery and shamrocking shenanigans, an oasis of indulgence in the midst of the Catholic lenten season, the day that honors Ireland's patron saint (and revered chauffeur of snakes), and by extension, has become a catch-all celebration of all things Irish. And as I explained in last year's St. Patrick's column, it's interesting to note how this occasion that started out as a strictly religious observance has now become a celebration for the ages, a day of parades and potatoes and whiskey and beer and stories and singalongs and more whiskey and beer. It's a holiday that, at its heart, celebrates an entire country and culture – and so, it's the perfect excuse to present another round of archival materials, this time focusing on the various whiskeys of Ireland, and how they've been marketed over the years. Here in America, Irish whiskeys spent much of the mid-20th Century in a distant third place behind their more popular Scottish and Canadian cousins, playing catch-up after having misjudged the financial impact of American prohibition and then failing to predict the increased demand for their product after repeal. And though the number of operational distilleries on the isle dropped steadily from an estimated 400 in the early 1900s to a mere four in the years following World War II, the holdouts maintained a presence in the US market, crafting ad campaigns that focused on their spirits' versatility and drinkability. 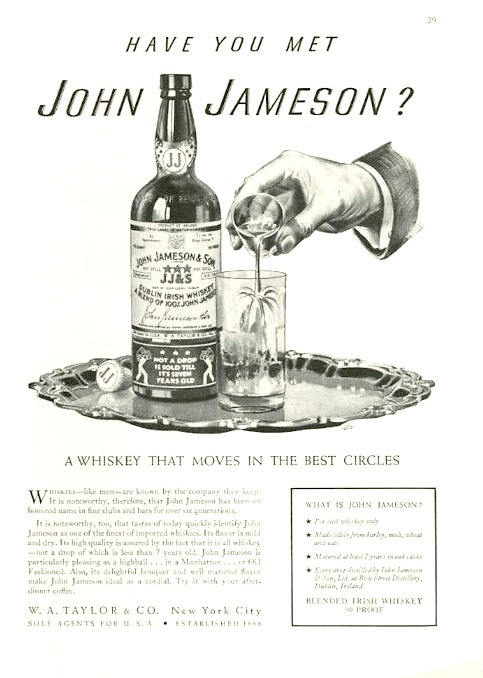 Of course, it wasn't all smooth sailing: up through the early '40s, the William Jameson company marketed their "Irish American" whiskey in direct opposition to John Jameson's all-Irish product, which led to some enjoyably terse back-and-forth. As the '50s dawned, the few remaining Irish distilleries banded together to hawk their wares, forming a single association for the purposes of marketing and promotion. 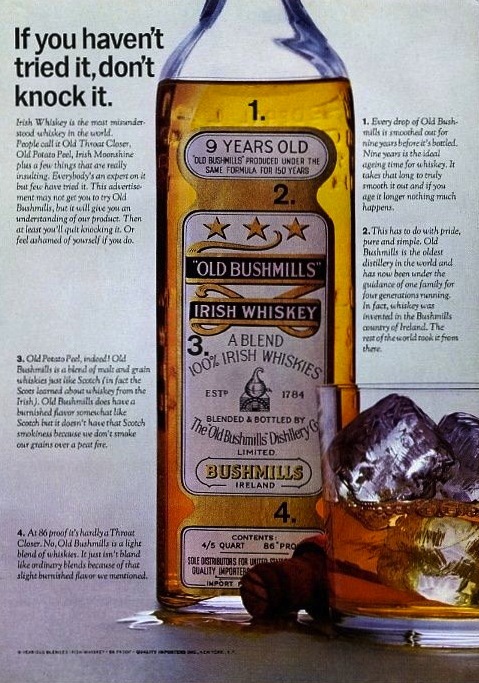 And through the '60s, '70s, and early '80s, those few surviving brands spent most of their ad dollars simply trying to re-establish ground in the American market, launching campaigns that stated the case for drinking Irish Whiskey in the plainest possible terms. ...While some simply tried to beat Scotch at its own game. And every now and then, some even remembered the built-in Éire-appeal of St. Patrick's Day, and incorporated it into their advertising. Today, after a long and hard-fought struggle, Irish Whiskey has reclaimed its rightful place, and become the fastest-growing sector of the U.S. market over the past few years. New distilleries are springing up throughout the Emerald Isle, and alcohol aficionados around the globe enjoy the rich and distinctive tones of Hibernian spirits. So this St. Paddy's, let's all celebrate the resurgence of Ireland's native alcohol, and gather together with loved ones to enjoy a glass of Whiskey... After all, who are we to argue with tradition?